After making your purchase, you can download the image and use it immediately for print, web or presentation purchases such as bulletins, homepage graphics, sermon openers and more. Now including graphics to use on Social Media to get the word out about your church's newest series! This countdown clock is used to communicate the planned start time of the service for the series “Rewind” to the audience. 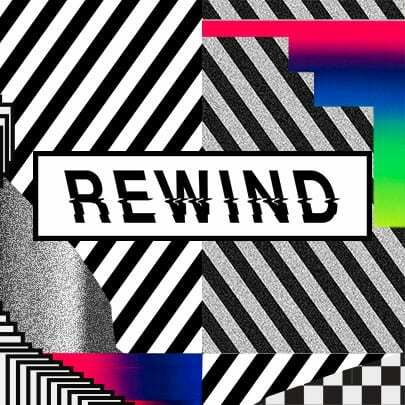 This logo loop will keep “Rewind” logo on the screen and can help kick off a service or use at anytime to display the title of this series. domineering coaches, and demanding parents. For many, it has a negative connotation. But discipline is much more positive and can be the one thing that helps us discover the amazing path God has for us. In the first message of this series, we go way back with Pastor Ed Young for a powerful look at three areas of self-discipline that will help launch us into a life-changing future! 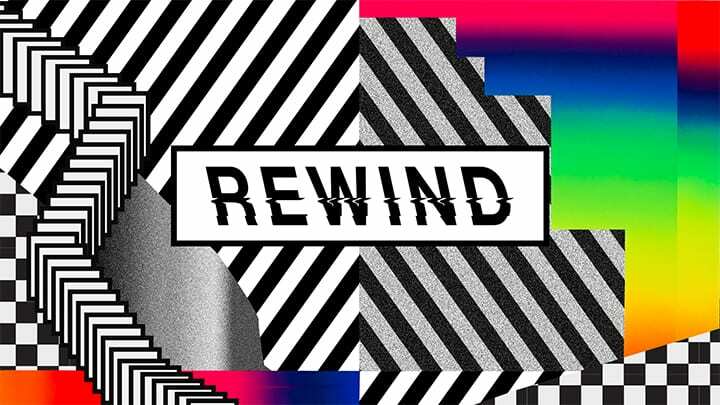 This week we're beginning a brand-new series called: Rewind. Now when you think about “Rewind” you think about the past, you know, going back, and I decided to go back. I'm talking about way back into my past because I started preaching about 30 years ago. And we've come across some old tape of me delivering certain sermons. So, I want you to see these sermons because basically the same thing that I talked about 30 years ago is the same thing I'm talking about right now at Fellowship Church. The time was somewhere in the '80s and the place was Houston, Texas. At the time, Second Baptist Church, that's the name of Dad's church, was probably the most attended church in North America. Lisa and I helped start Fellowship Church in 1990, so this was two years before our church actually kicked off. I wasn't speaking at the main service on Sunday morning, this was Sunday night. So, if you hear me say "night," we had Sunday night church. So, this is the message I did – Philippians chapter 4, verse 13 – as we go back to 1988, way, way back there. Let's check it out. - As we begin together tonight, turn around and introduce yourself to someone you don't know and give them a smile and a fellowship of excitement welcome. - This guy here was our, back in the day we called him our Minister of Music. Boy that sure is a nice sport coat he has on! This sanctuary seats around 6,000 people legit, and that's a massive, massive place. I'm just thankful that God gave me an opportunity to speak in a place like that and to grow up in a great Christian home like I did. Oh, there's old Eva Walters. Eva is a great, great girl. Lisa and I have known Eva for probably, I bet we've known Eva for 35 years. She still is singing solos at Second Baptist, Eva Walters. And that was like, that song there, that for us was like rocking, I mean, that was on the cutting edge. ♪ He never failed me, he never failed me yet. ♪ ♪ He never failed, he never failed me. ♪ It's a great song, it's a great song. We had her sing that one day at our church. I want you to check this out: trombone, trombonist out, look at this guy. It was so choreographed; the services were so well planned you couldn't be a second or two late. When the choir stopped, boom, you had to get out of your seat and make your way to the pulpit and we sat in these throne chairs, you'll see these throne chairs, it was kind of uncomfortable. You're sitting up there and everyone's looking at you, and like, what do you do, and all of a sudden, man, when it's your time, they give you that holy nod, boom, you better be there. Man, my heart's beating right now. Look at me, I'm nervous as a cat. - Now you know what's so interesting about that is, I assumed – I wouldn't do that now – that everyone had a Bible, which is interesting. - Philippians chapter 4, verse 13. And as you're turning, I want everyone to stand. Everyone on the platform, the choir, everyone stand. - I want everybody to stand right now, we're going old school back to 1988. Everybody stand at all of our campuses and do these hand signals. - "Says, says," I sound Joel Osteen. "It says, it says." Do I sound like Joel, am I just joking? - This is my Bible. I am what it says I am, I have what it says I have. Amen. Think of someone you know so well that when you hear their voice, you immediately know who they are. In part two of Pastor Ed Young’s series “Rewind,” we will discover the importance of not only learning to recognize the voice of God, but the power and potential that comes with living out what He says. Welcome to Rewind, part two. We're going back into my life. This one was done, I think, 32 years ago in 1986. 1986 was the year I graduated from seminary. LeeBeth was born, our oldest, in 1986. I was one of the pastors on staff at a church called Second Baptist Houston. It's still there today. Dad is 82 years old and still going strong. Even though I did this message in 1986, it relates to you and me today. - I feel the need, the need for speed. I am no stranger to yard work. As a young boy, I remember vividly playing basketball, baseball in our yard with some of our friends. Dad bought that suit for me, it was all polyester, before I got married several years before this. So that was I think my only dark suit that I had. And you're sort of supposed to wear dark suits in this context. - What you talkin' bout Willis? - And a weed pulling party was always bad news because it meant that myself and all of our friends had to go outside, and we lived way out in the country, and our front yard was an entire flowerbed. It only had like five flowers and trillions of weeds. And we would go out there and pick weeds for hours and hours and hours, and I'll never forget as a young boy looking down at those flowers among weeds and even then, realizing what a contrast flowers and weeds are. You see a beautiful flower there among these brown, green, ugly weeds. - [Man] Beautiful backswing. That's, oh, he got all of that one! - Now tonight, we're going to look at a person, a man by the name of Samuel, who is definitely a flower among weeds. And the reason Samuel was able to be a flower among weeds was because he listened and obeyed the voice of God. - I sound like Joel Osteen. It says, it says. Do I sound like Joel or am I just joking? - Before we look at this section of scripture in the 3rd chapter of 1 Samuel, let's bow for prayer together. Lord Jesus, I thank you for this opportunity to worship you, and I ask that you would speak through me and give me the words to say so that no one may leave this place unless they know you in a personal way, for we ask these things in your Son's precious and holy name Jesus Christ, Amen. Turn to First Samuel, the third chapter. We're going to look at a section of scripture that is very, very descriptive as far as the call of God, and that's verses one through 11. 1 Samuel 3:1, “Now the boy Samuel was ministering to the Lord before Eli, and word from the Lord was rare in those days. Visions were infrequent.” Now the first part of the first sentence there, “Now the boy Samuel,” that shows Samuel's youth. We feel that Samuel is around 10 to 12 years of age, and you know the story. His mother, Hannah, had dedicated him to the Lord before he was born, and she gave him to Eli who was the priest of the tabernacle at Shiloh. We’re going back to the 80s! Join us for this throwback series as we look back at some of Pastor Ed’s first messages, and hear his running commentary on not only the trends and topics of the day, but the timeless Truth of God’s word.